“Necessity is the mother of invention”-Plato. Or something like that. 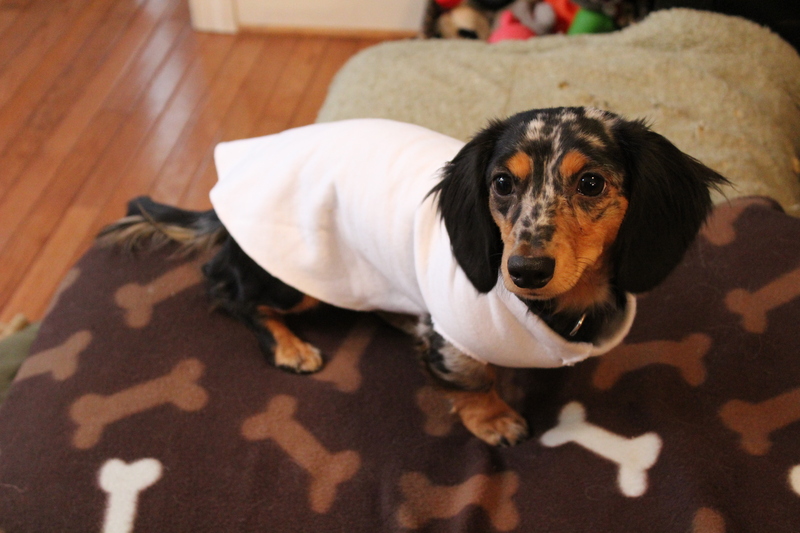 At any rate, this weekend it happened…in the form of a homemade dog sweater! This weekend my son came to visit with his 9 month old miniature dachshund puppy. Her name is Delilah. She is a seven pound bundle of puppy energy! We had a few chores that needed to be attended to such as getting the truck inspected, the oil changed and a Daddy-and-Me day of activities. So, while the guys were gone, they left me in charge of little Miss D.
The temperature that day was 31 degrees, snowy and cold. I wanted to go out and chop wood and take the dogs with me. Lacey, who carries her own fur coat and is never cold would be fine. And Lacey LOVES the cold weather. Little Miss Delilah however, was shivering. My son forgot her sweater so I figured I needed something for Miss D. to wear to keep her warm while we were outside. Here is Lacey enjoying the nice cold pavers on the veranda…. I remembered an old white sweatshirt I found while cleaning out the basement. It was OLD and had a few stains on the body of the shirt. I really planned on tossing it but then I had an idea! A sweater for Miss D. using the sleeve of the sweatshirt! My son always complains about sweaters not being long enough for a dachshund. Even a miniature dachshund. So I wanted to make this one long enough to cover her back side. The sleeve was perfect! The natural angle of the sleeve was ideal too since it was longer on her back (the top of the shoulder on the sweatshirt) and shorter underneath. The cuff was too small to go comfortably over her head so I cut it off. I cut out two holes for the front legs and it was perfect! We rolled down the top for a “turtle neck” and Delilah was toasty warm! She loved it! A 5 minute DIY dog sweater! And look how sweet Miss Delilah looks in her new sweater! I took her outside in her new duds and she was nice and warm. My son took Delilah’s new sweater home with them. She loves it! As I am cleaning out our closets in the future I’ll keep an eye out for a future sweater for Miss D. She’s a cutie, right?